Marian Rivera, Dingdong Dantes, and Baby Zia have already made it a family tradition to dress up for Halloween. This year, the famous trio decided to join the "other side" by becoming Batman's villains. Marian and Dingdong revealed their Halloween costumes on Instagram early today, October 31. Dingdong donned a green suit and a mask to portray The Riddler, who was played by Jim Carrey in the 1995 film Batman Forever. Marian channeled Poison Ivy, and wore a green body suit and a red wig. Poison Ivy was played by Uma Thurman in the 1997 movie Batman & Robin. The couple's daughter, Zia, was Joker, who was played by the late Hollywood actor Heath Ledger in the 2008 superhero film The Dark Knight. In a separate post, Marian explained why they picked Joker's character for Zia. She wrote, "Most of the time, she is the JOKER of the family. 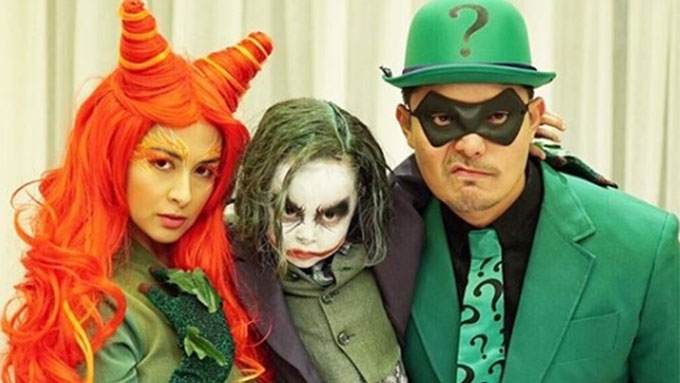 #MariaLetizia #TeamDantes #Halloween2018"
In 2017, they were the Dantes League, with Dingdong as Batman, Marian as Catwoman, and Zia as Batgirl.